Ex Demo & Clearance Bargains! FAQ - Can I Mount A Different Binding On To My Old Ski? The stiffest version of the mighty Freedom SL, THE high performance men's freeride boot. Scarpa's Freedom SL was a real leap forward in Freeride boot performance. Now the Freedom RS has arrived to do for the SL what the Maestrale RS has done for the Maestrale. 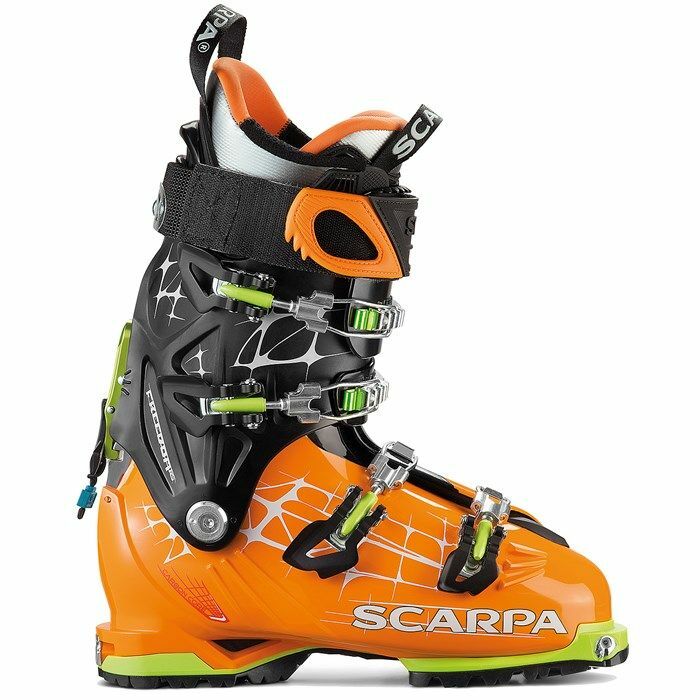 By using the stiffer Grillamid plastic, injected into the same molds as the Freedom SL, Scarpa have produced an even stiffer and more powerful version of their flagship freeride boot. The Freedom RS are an AT boot designed for the way back down. They combine all the features you'd expect from a top of the range Freeride boot, excellent ski performance, interchangeable sole units for full binding compatibility, etc, with AT functionality that would normally be the reserve of dedicated ski touring boots such as an excellent range of cuff motion in walk mode and a respectable weight. This makes the Freedom RS a superb choice for people wanting a powerful and versatile boot. Whether you're skiing off the lifts, on powder hunting day tours or even planning the occasional longer tour the Freedom RS will deliver the functionality and comfort you require. The 27 degree range in walk mode allows smooth and unimpeded skinning and at 3.5kgs per pair the Freedom RS are suitable for multi day tours although if you are planning on doing a lot of touring or climbing then you would still be better with a dedicated lightweight touring boot. The Scarpa Freedom RS uses a carbon core to deliver high-performance downhill in a truly multipurpose boot. They have Interchangeable soles that are bolted through the carbon-fiber frame offer compatibility with any ski binding, with a design that improves strength and power transfer to the ski. So how do they fit? The Freedom RS have a medium forefoot width and can be easily stretched to make them wider, the heel fit is neat and this keeps you held in place, they are low volume over the top of the instep area and they are tricky to stretch at this point so they aren't well suited to people with very deep insteps but for average foot types the low volume in this area gives excellent transfer of power when skiing. We strongly recommend that the Scarpa Freedom RS boots are fitted with a sport foot-bed and custom fitted by a skilled boot fitter. Please call 01943 816011 or email e: info@backcountryuk.com for an appointment. All ski boots fitted by us carry a boot fit guarantee. We have moved to Otley! With free parking and a lovely setting click here for directions to our new premises. © Copyright 2013-2017 Backcountryuk2 All rights reserved.